Director, Interim Executive Director, to now Executive Director. Tim or Carp, as he is known by camp staff and campers, has helped direct camps for the last 14 years. He and his wife Rebeca have made Hidden Acres their focus and mission field bivocationally for seven years when they stepped out in faith to move to Hidden Acres and have worked together to grow the ministry outreach. We thank God for allowing our camp to be a part of God’s great calling to go out into the world and preach the gospel. Like the shepherds and wise men in the Christmas story, we look forward in anticipation to what is to come and what God plans to do next. Please help us congratulate Tim Carpenter in his new role, and let us start a momentum of prayer for Hidden Acres today and as we begin a new year. When we got closer to the border, we stopped to pick up three translators - Rebecca, Raquel, and Ruth Escobedo. Ruth was only 7 years old when she started going with our group to translate! For the next 14 summers I was blessed to go on these Mexico Mission trips. Rebecca, Raquel, and Ruth were awesome servants. They showed such concern for the lost and were always gracious and kind, never complained. This connection is how I started coming to Hidden Acres. Their friendship, fellowship, servanthood, & joy for the Lord is contagious. Why do I spend my week of vacation at Hidden Acres and travel from Missouri? Because it refreshes my soul. It is a joy and an honor to serve here as part of the kitchen crew. Charlotte has a great sense of humor and kind heart. Her LOVE comes out in the food she prepares from SCRATCH and in the manner in which she treats everyone. Esther has an excellent work ethic, reads scripture over me, and is always good for a laugh to make things less stressful! Jacob did a LOT of dishes this week! Jennifer can dice tomatoes like an expert chef and it’s always good to have a mathematician in the kitchen! Judy is a joy to be around. It is fun to watch the staff, and campers grow / challenge/ stretch us in our faith. The youth bring energy. I am grateful for each one involved here! Building relationships and drawing closer to Christ is the goal. My heart is full. Memories have been stored up. Kitchen Crew for Great Commission Camps Week III Summer 2017. Judy Pictured second from right. Did you know that there are 19.5 million refugees in the world and that 51% of them are children? 200,000 of these refugees live in North Texas alone. Nyanaath* is one of these refugees. Nyanaath’s family fled from a bloody civil war in the African country of Sudan. During her first winter in Texas she came to school crying with no coat and no socks. Her family was unprepared and unassisted. It is these children, the Nyanaath’s of our community, which Hidden Acres desires to reach. In 2007 Hidden Acres began partnering with Refugee Resources Inc. to open the door to a new kind of camp ministry—a camp that reaches the refugee population in Dallas. But these mission camps serve a dual purpose. Beyond serving refugees the camps are also meant to awaken the hearts of Christian teenagers and college students in North Texas by calling them to serve the mission field at their doorstep. And that is where we come in. As a youth pastor at Rockwall Presbyterian Church my prayer for our students is that they would mature and grow in Christ-likeness. One of the main markers I look for is an ability to focus less on themselves and instead serve others—in particular, the vulnerable and the defenseless. So for the past three summers our youth have raised money to go on local mission trips and work with refugee children in our area. 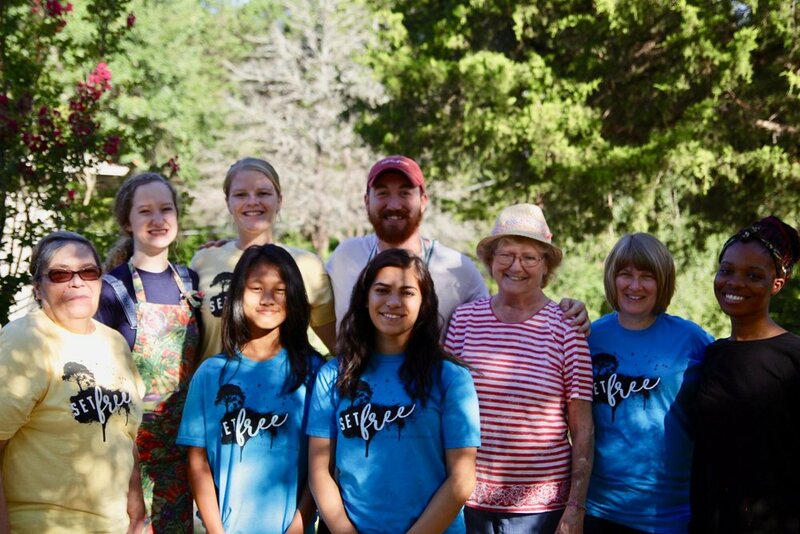 This summer we partnered with Hidden Acres for one week in July to help host and serve. What an amazing experience. We will never do it any other way! Twenty-seven of our students were privileged to connect with over eighty children. We sang with them, did crafts, competed in games, performed archery, canoed, swam, and had daily small group times where we looked at God’s word and prayed together. It was a game-changing week for RPC Youth. We formed relationships, we made memories, and our faith was enriched. One student, Garrett, shared how hard it was to hear from a small child that there were times he had gone ten days without eating, and yet he was amazed by this child’s joy. Robert was impressed by one of the older boys. He naturally served and cared for all the other children around him. Chloe shared how she was able to talk about Christ’s love and to pray with a girl in her group during the week. One of our seniors, Noah, ended up explaining the trinity for the first time to one of the teenage campers. Each one of our students was challenged and encouraged as they formed friendships with the kids, loving on them and serving them. We went on the trip in order to be a blessing, and we ended up being the ones blessed. And do you know the most miraculous thing of all —twenty-seven teenagers for an entire week, and not one single complaint. My prayers were answered! Baby-E taught me how to love everyone. Snips taught me how to be leader. Flick-flock taught me how to be kind. Shaddy taught me how to have fun. Skyscraper taught me how to lead by example. Farquad taught me how to live in godliness. Sen-sei taught me how to be a friend. Last Summer as I was cleaning up around the house I came upon a scrap of paper. On it was a note scribbled by my son, Seth, as shown above. I thought it was such a special thing for him to be inspired to jot that down. At Hidden Acres one of our aims is to teach both our staff and campers how to be Christ-like leaders. Our summer camp leadership team is called “the Core” and is comprised of young leaders who have shown dedication to Hidden Acres summer camp and it’s ideals and have served for several years. The Core helps plan and coordinate summer camps and stay involved through the year helping with other events. We are blessed to raise up our kiddos around such caring and servant-hearted people. While at camp we teach Biblical concepts on leadership. I think that Seth’s note reminds me that while little ears are listening, little eyes are watching and learning by the example they see in our Core leaders. Amanda Smith (Baby-E) has such a friendly manner about her that when she smiles at you, you feel like you just made a new best friend. It has been so rewarding to see Cayla Lewis (Snips) step up into a leadership role at camp. Her love and energy inspires others be enthusiastic about their work. Summer Stevens’ (Flick-flock) kindness makes her a great counselor and leader at camp. Her sweet and encouraging personality make our campers feel loved. Shaddrack Ntambwe (Shaddy) is like the energizer bunny at camp. He is a natural at leading games and worship songs. His fun and energetic personality fires up those around him. Robert Willis (Skyscraper) is a very hard worker. You can count on him doing any job that is needed to get done. He is a doer who leads by example. Heather Henry (Farquad) is a shining light to those around her. She is a natural teacher who inspires people to be the best they can be as they follow Christ. Jason Henry’s (Sen-sei) open and friendly personality draw people to open up to him. He is patient and kind to those around him, making him a great friend to have. We have been blessed to have this group of people leading the summer camp program at Hidden Acres. Along with them Hidden Acres has some of the best counselors around with the same kind of traits that make them great leaders. This was my first time to work at a Hidden Acres Girls’ Retreat. I was not sure what to expect going in, but I left seeing some amazing impacts from God. In just two days, many of the young ladies broke out of their comfort zone and gave God control. On the first day one particular young lady in my group told me she wanted to be a leader for Christ. However, she said she did not believe she could. By the end of the weekend this same young lady was helping in every activity. She helped me in our small group, sharing her testimony and being a great encourager to the other young ladies. You could see God opening doors for her to be a leader throughout the weekend and she took every opportunity. On the last night she shared with me that she knew she could go out and be a leader in Christ wherever she went. This was such an amazing opportunity. I am thankful to be a part of this retreat. I onlyshared a story about one of the girls because it would take too long to share them all. I cannot wait to see the things that God is going to do with these extraordinary young ladies. It was such a privilege to get a glimpse of it at this retreat. Sethi is a refugee from Tanzania who now resides in inner-city Dallas. He spent several weeks this summer serving on staff for Hidden Acres Mission Camps. As we talked with him about his life, Sethi told about some of the hardships of being a child growing up in a refugee camp. He remembers hundreds of families displaced from their homes and struggling to meet their daily needs. He and his family were given the opportunity to leave Africa as refugees and relocate to the USA for their safety and well-being. While the transition to life in America is not easy for refugee families, Sethi thanks God for the freedom he has found in America. When asked what Hidden Acres means to him, he replied, “Hidden Acres is like a second home to me.” He remembers crying on the bus ride home his last day of summer camp at Hidden Acres several years ago. “I did not want to leave. People would tell me that I would be back next summer, but next summer felt so far away. I always wanted to stay at least two more weeks.” Through the years we have seen Sethi mature into the young man he is today. His dream to spend more weeks at camp came true when he was invited to join our summer camp staff in 2013. It has been a blessing to see him become a leader for God’s glory. Dieudonne tells his story and how Hidden Acres Summer Camps have impacted his life.